IN THE EARLY YEARS OF THE 20th CENTURY, at the height of the Arts and Crafts movement in America, Charles Sumner Greene and Henry Mather Greene took an intensely artistic approach to the design of houses and interiors, creating some of the most beautiful and highly admired residences in the history of American domestic architecture. The brothers were not alone in this comprehensive approach to architecture. They belonged to a generation of artist-architects that came of age in the late 19th and early 20th centuries. Their peers included Frank Lloyd Wright in the United States, C.F.A. Voysey in England, Charles Rennie Mackintosh in Scotland, and Joseph Maria Olbrich in Austria. 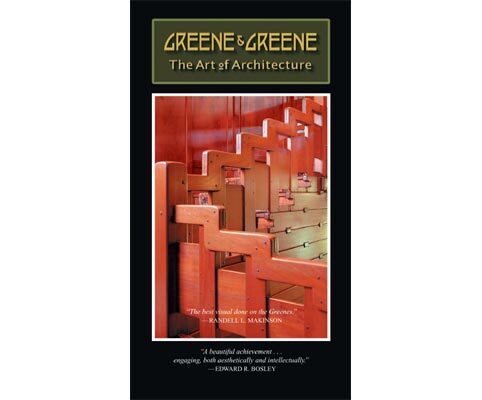 Greene & Greene: The Art of Architecture chronicles the creative evolution of Charles and Henry Greene, beginning with their early efforts to blend American, European and Asian design concepts into an architectural vocabulary suited to the landscape and culture of Southern California. It continues through the creation of their so-called �ultimate bungalows� of the years 1907-1910 and concludes with the independent projects that characterized their latter years. In addition to the famous Gamble and Blacker houses, the production examines a number of milestones in their architectural journey, including the Charles Greene and Arturo Bandini houses in Pasadena, the Adelaide Tichenor house in Long Beach, the Charles Pratt house in Ojai, the William Thorsen house in Berkeley, the D. L. James house in Carmel, and the Walter Richardson house in Porterville. In all, more than fifteen residences are highlighted. The one-hour documentary also examines the Greenes� passionate interest in interior design‑‑in creating fully planned and integrated living environments. It features archival photographs and rare film footage, sketches and floor plans, and contemporary photography of existing buildings, woodwork, furniture, and a variety of glass, metal and textile objects. It also features illuminating comments by several prominent authorities on Greene and Greene, including Randell Makinson, Robert Judson Clark, Bruce Smith, and Edward Bosley, the current director of The Gamble House in Pasadena. Additional insights are provided by master craftsman Jim Ipekjian, restoration architect Ted Wells, and two members of the Greene family, Isabelle Greene and Betty Patchin Greene. Greene & Greene: The Art of Architecture was written, produced and directed by Paul Bockhorst, in association with the Society of Architectural Historians, Southern California Chapter. It is narrated by Richard Doyle, and the original musical score is by Paul Morehouse. Funding for the project was provided by The Ahmanson Foundation, The James Irvine Foundation, The Ayrshire Foundation, the Joan Irvine Smith and Athalie R. Clarke Foundation, and Sidney and Alexandra Sheldon.